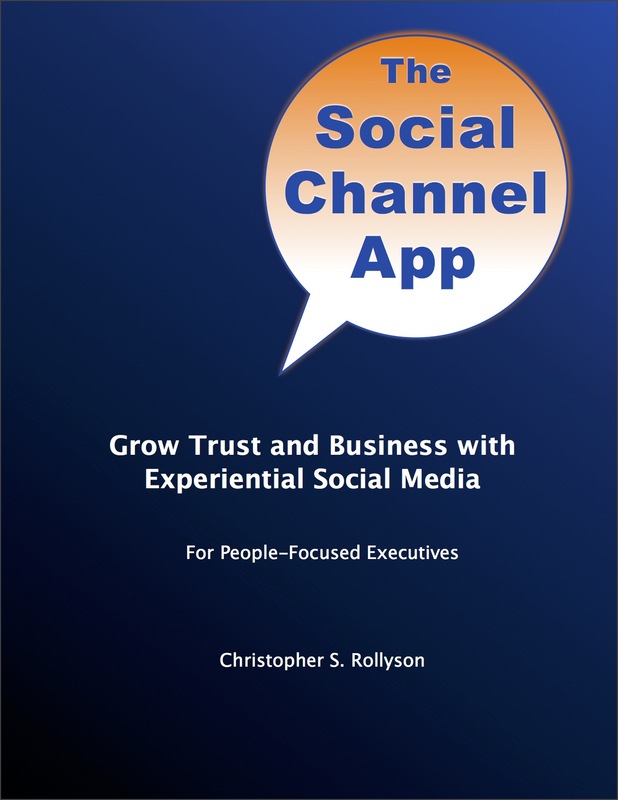 The Social Channel App is an interactive guide to experiential social media and social business. Experiential is a new kind of social media that interacts to build trust with your key customers, employees, and other stakeholders. Higher trust improves customer lifetime value, employee engagement, and dozens of other business outcomes. 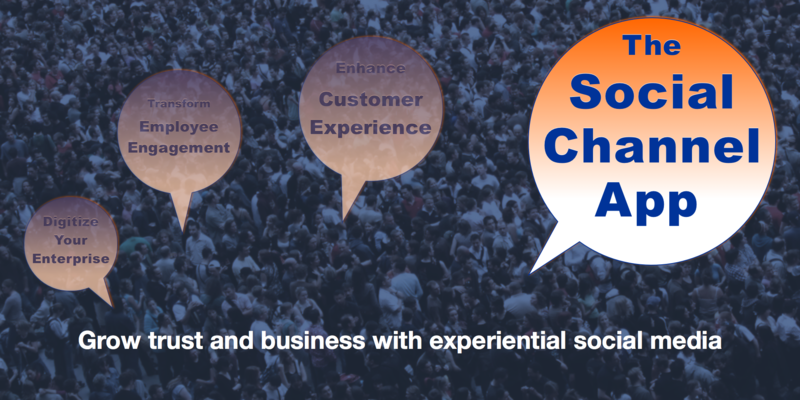 Social business uses experiential to transform firms. 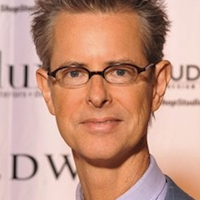 CMOs boost budgets for the same, or even lower, results. CDOs lead transformation initiatives with poor information about user impact. Chief customer officers strive to improve customer experience while depending on outdated survey methods. Sales executives struggle to keep good people because reps are so unhappy. The Social Channel App shows how to build trusted relationships at scale. People have always done more business and stayed longer with firms they trusted. This is a simple fact, but how many firms earn your trust by putting your interests ahead of theirs? Trust is the currency of business because people prefer and buy more from firms they trust. And firms earn trust by putting people first. Experiential social media builds trust very efficiently by interacting and caring in digital public, where everyone can see it. The App activates the Trust-Business Chain Reaction, which shows the dynamics between interaction, trust, preference, and business. The longer firms interact and care, the more the results accumulate. Experiential social media is the new practical way to solve many low-trust problems that plague firms today. You can use it to transform customer experience and employee engagement. You can cut the costs of customer acquisition, churn, and digital transformation while increasing customer lifetime value. Its focus is high-impact niches of people, not large general demographics. Its key action is helping people get what they want, not promoting the brand. Most of its activity is interacting with people, not sharing content. It speaks through actions, not words. It uses trust-based metrics, not promotional social media metrics. Most of its interactions happen on third party sites, not brand sites. Menus on every page that link you to app submenus and support. 100s of links that connect within its 450 pages as well as externally, so you can navigate naturally, according to your learning style. Of course, you can also read it like a book, cover to cover. 7 “clickstreams,” learning paths that are based on common social media use cases (situations). They enable users to get what they need in fewer pages. 2 business applications, Customer Experience Transformation and Employee Engagement Transformation. They show you how to use experiential to heal two of the most painful symptoms of low trust in business. 3 levels of support are integrated right into the App, so you can get help with applying the App’s tools, collaborate with other users and get help with your individual situation. Footnotes that guide you to external resources, where you can drill down further. Enterprise-strong: App tools are based on the Social Network Roadmap(SM), a full lifecycle social business methodology developed by CSRA and refined with commercial, nonprofit and government clients since 2008. SNR is designed for the world’s most complex organizations, but anyone can use it. The App includes 2 levels of SNR, so you can pursue lean or full-bore transformation. The App has updates. Try that with a book! See for yourself: scroll through the preview by clicking the image, above right. I wrote this user agreement, not my lawyer. Its two cornerstones are trust and transparency. By joining the beta and buying the Social Channel App, you’ve trusted me to give you an experience that’s worth your time and money. If you’re not happy with the App at any time, contact me to get a refund for what you paid, no questions asked. By delivering the App to you while minimizing digital “rights” management features, I’m trusting you to not share your copy with everybody and their mother. I’m offering the beta version “as is,” and that’s what you’re buying. If/when Version 1.0 appears, registered beta users will get a free upgrade. When you join the beta, you become a registered user of the Social Channel App, and you can join the Private User Community. You get two levels of free support. The App doesn’t give professional advice; you are responsible for your results, not me. By clicking this Buy-the-App button, you’ll open a shopping cart where you have several payment options. If you want to pay by credit or debit card, use the PayPal button, which opens a screen that includes “Pay with an online bank account, debit or credit card, or PayPal credit.” Once your payment is verified, you’ll get a thank you screen with a link to download the pdf. Since the Social Channel App is, well, social, it has several places where you can connect and learn about the transformational power of experiential social media. The Google+ and Facebook Pages have extensive additional information about the App, so check them out to get a better feel for it.You can also join the App’s Google+ Public Community or Facebook Page and post questions there. Also feel free to post questions in comments at the bottom of this page. The App’s Facebook Page offers similar content and interaction as its Google+ Page. And you can post and collaborate, too. Its “About” tab has more info. The App’s Twitter feed offers select articles about customer and firm business challenges, and key news about the App. It follows CX and employee engagement innovators. The Google+ Page offers the most complete coverage of social transformation and news about the App; if you also join the Public Community, you get its posts right on the Page, too! It has extensive info about the App, including videos. The Google+ Public Community is the App’s most interactive space. Members collaborate around business issues like customer experience, acquisition, churn, and employee engagement, online and via Hangouts (live video ). The App’s LinkedIn Page holds discussions about using experiential to grow trust among employees, which significantly improves customer experience and business. Experiential social media is revolutionary, so how did it come about? Here are a few insights behind experiential and the App. Also see the What If? video and the 2015 case study. “People have always done more business with firms they trusted, yet most firms use social media to promote, which reduces trust. During the last ten years of client work, I’ve discovered and refined how to build trust very efficiently and at scale, and I saw how this could drive business results to a whole new level. I learned that, when firms focus on building trust in digital public with niches of people, they can activate digital social’s network and annuity effects, and large groups of people want to do business with them, over and over. They also become magnets for employees who are passionate about their work. Digital trust-building is so revolutionary that I had to share it. I started writing a book because I’d done that before, but I realized that interactivity would empower my users more, so I transformed the book into an app. Most people will experience it as an active learning experience, and I think they’ll get better results. Thanks for checking out the Social Channel App. If you have any questions about the App, or you would like to inquire about a speaking engagement, please reach me here. If you’d like to let other people know about the App, just use the nifty sharing icons below, which include social media and email. If your favorite isn’t shown, the green tab far right opens many more choices.